Ladies and Gentlemen, needlework enthusiasts of all ages, step right up to witness an amazing feat. 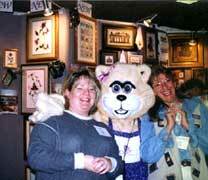 Before your very eyes, a cavernous exhibit hall, mountains of tables and chairs, and miles of extension cords are transformed into the "Greatest Show on Earth "The Cross Stitch Festival, sponsored by the Creative Arts & Textiles Show (CATS). Your Passport to Needleworks "Big Top!" Just like Ringling Brothers a massive amount of planning, coordination, teamwork, ingenuity, creativity, sheer effort and muscle power culminate in this amazing three-day event. Across the country in six different locations the CATS caravan arrives to create a place of wonder. Long grueling hours of preparation precede opening day. How those involved can appear fresh and enthusiastic when they greet the first attendee is a marvel! These folks are surely committed to the maxim, "The Show Must Go On." What is the Cross Stitch Festival? Lorri Birmingham and students strike a pose! The thrill of the three circus rings is experienced at the Cross Stitch Festival. Classes, Shopping and Events continue simultaneously over the three days keeping attendees entertained, educated and happy. The Festival provides a unique occasion for needleworkers to immerse themselves in the creative art of stitchery. In one ring, the Shopping Mart presents industry representatives sharing a dazzling array of the latest products, techniques and industry information. In another ring, classrooms offer a mind-boggling variety of classes taught by outstanding needlework designers and instructors. The third ring of special events involves stitching, lectures and meals.. The intensity and excitement of the Show is a direct reflection of the life long passion for needlework felt by the owners of the Cross Stitch Festival. This passion keeps them on the road bringing their love of needlework to stitchers across the country. You'll recognize our Masters of Ceremony, which include Charlie Hanney (Charlie's E-Z Mats), Jo Lee Tarbell (Designs by Jo Lee), Liz Turner Diehl and Mike Manning (Liz Turner Diehl, Inc.), Lilias Ralph and Dave Boone (Gripit Plus! ), Phil and Lorri Birmingham (Lorri Birmingham Designs), Shar Shackett, Marilyn Vredevelt (Stoney Creek Collection, Inc.), and Maureen Appleton (The Heart's Content, Inc.). They are fortunate to be able to work at what they love best and want to share their passion with others who feel as they do. It's truly a Festival atmosphere full of fun! Choosing a suitable site for the Festivals is a challenge. It's like a jigsaw puzzle with many unique pieces and all must be included to complete the picture. The first set of puzzle pieces required are an exhibit hall, classrooms, banquet facilities, hotel rooms, and restaurants ideally housed in the same location or in close proximity. These must be of high quality. The next set of puzzle pieces involves location, the city, its geographic location, its accessibility and environment, in general, its attractiveness as a destination. Any one Show will draw attendees from areas within driving distance, as well as, those from other parts of the country and the world. Both the realities of the location and the perception of the location as a destination affect whether a stitcher will attend. The goal is to choose an area with a high population density that is easily accessible by land and air and is perceived to be a safe, fun destination. The next set of pieces involves cost. Cost is a concern not only to the Show management but also to attendees, vendors and instructors. Cost and location are closely linked. A location must be "affordable" for everyone to make a site a good fit. The whole process of putting the puzzle pieces together hinges on timing. Convention facilities like those needed are committed years into the future. Timing has it's own set of pieces including the availability of a facility, the season of the year, holidays, and the proximity to another industry or related industry Show. Choosing a Show site is a process of turning each puzzle piece in many ways to find a perfect fit. Finding the best picture for all involved is a complex process full of compromises and adjustments. When it all comes together the Show can go on! It's like a stitcher's wildest dream come true or Christmas in July - a giant needlework shop under one roof. Needlework designers and manufacturers from across the nation meet under "the big top" to share their best up-do-date products and techniques with needlework enthusiasts. The Shopper's Mart is the center ring to many of the Show's attendees. They come to have the ultimate needlework shopping experience. Our goal is to provide a full spectrum of products to those attending the Show. Our exhibitor database includes hundreds of potential exhibitors. In August of each year, we mail exhibiting information for the coming year to everyone on our list and then some! The decision to exhibit involves many factors for the exhibitor. The exhibitor must weigh the cost of exhibiting against the potential income they might earn. 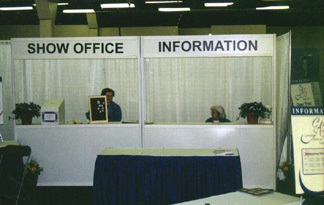 The cost includes booth space fees; electrical and/or telephone fees and booth equipment such as skirted tables, peg board, chairs and walls that are not part of the standard booth set up. Shipping product to the site is very costly so many exhibitors choose to drive to cut down on shipping costs. Travel, hotel costs and meals must be included. Exhibitors also have personal schedules they have to work around. Projections of potential income are derived from the exhibitor's previous experience at Shows, their product line and their own promotional efforts. The number of attendees is their greatest concern. 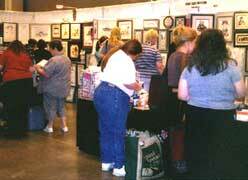 That is why it is true that the more attendees, the more exhibitors you'll find at a Show. Exhibitors find that their products are well received in some parts of the country and not in others. They take all of this into consideration when deciding whether to exhibit. Exhibitors are always eager to meet you! Here the staff in the Cross My Heart booth is ready to help you find the latest stash to help you fill your stitching bags! Exhibitors are required to send in a contract, which specifies which Shows they will be attending and booth size. As we receive the contracts, we begin to fill in the booth space for each Show until it is full. 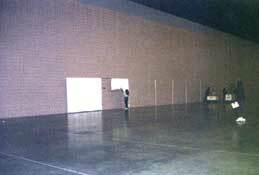 From the list of exhibitors and their spaces, the exact layout of the Show floor is designed. Exhibitors list special needs or preferences on their contract; all of these are taken into consideration before completing the floor plan. Next the exhibitors are sent Show specifics and sign up sheets for offering courses taught in the Shopping Mart (Make It/Take It's) and FREE Lectures. The Exhibitor name is placed on our web site with a link to their web site (if available). We also send promotional information for them to help promote their exhibition with us. About 4-6 weeks prior to each Show, the exhibitor receives a packet from us containing site-specific information and a Manual from our chosen Decorator for the site. The vendors use this information to order any extra booth equipment and arrange any shipping needs the Decorator will fill. Each site has its own Decorator. Then the fun begins . . .raising the Big Top in each Show city! Does Every Exhibitor Create Their Own Booth? Wednesday: 8am-8pm ­ Exhibitors move in and set up booths. The floor plan is created on paper before arriving at the Show. On Tuesday, the Decorator begins bringing life to the plan by "masking off" the floor to show boundaries for each booth, Make It/Take It's, FREE Lectures and our Showcase of Needlework. Then the "rag" crew goes to work setting up pipe and drape to section off each booth. Once the pipe and drape is in place the Convention Center or Hotel staff begins dropping electrical and telephone lines. The hall is transformed from a cavernous room to the Festival right before our very eyes. On Wednesday the exhibitors arrive early! By 8am, staff person Nancy Morrissey is all set up and ready to welcome exhibitors. She provides them with a Move-In package, which includes local information and their name badges. She is there to give them the best unloading site and their booth location. When exhibitors arrive to unload and set-up they are dressed for work. Yes, even overalls can be seen during set up. . . but just wait until the Show opens! You'll see them transformed from work crew . . .voila to professionals welcoming you in their booth!! 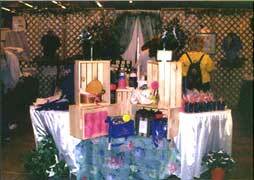 Exhibitors are responsible to create their own booth atmosphere. 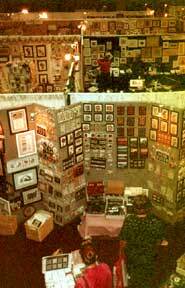 It is amazing to see a 10 x 10 concrete floor transform into a needleworker's paradise! The Souvenir Booth is all set up and ready to welcome you! During each Festival, a meeting is held on set-up day to share Show details and industry news with the exhibitors. 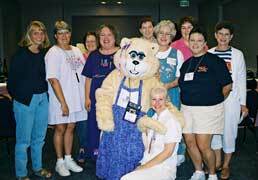 Many exhibitors attend shows together all year long and become a "family," so it's fun to catch up. CATS personnel also give details of the Festival including move out, special promotions and security. Exhibitors can then take advantage of a "30 second commercial" ­ a time to share news about any new products they are offering. This feature gives every exhibitor the information needed to direct attendees to other booths if they do not carry a product the stitcher is looking for. The congenial atmosphere of these meetings reflects their desire to see every stitcher leave the Shopping Mart with everything on their list and more! The Shopping Mart even accommodates husbands in the "Hubby Corner." This area comes complete with the daily Newspaper and a television with remote control! What man can resist a remote control??? Once the weekend is over tear down begins. The Shopping Mart is history in just a couple hours. It's always sad to say goodbye to shoppers but even harder to say goodbye to our family of exhibitors. But . . . the next Festival is just around the corner and we start all over again! Be sure to stay tuned for future installments in this ongoing series.